For Relapsing-remitting MS we currently have option of highly active therapies, as well as first-line therapies that are less efficacious. You may question why anyone in their right mind would develop a treatment that was no good, then conversely ask yourself, why if there are treatments available, even not so good ones, are some people not any of it? This is not me pitching for the next presidency, but this is the paradox that we currently live in. The naysayers will tell you that there is the so-called benign MS, resulting in a small few that would never have needed treatment in the first place; a hat-trick that you cannot argue against, despite the multitude of graphs that you produce demonstrating otherwise. Just the mention of it is enough to introduce doubt into the most learned of our colleagues. Maybe, we were going about this the all wrong way. From now instead of fighting it, my tactic is going to be to say that “some treatment is better than no treatment“. So what am I basing this all on? Just recently made available to us is data spanning 21 countries (the MS-Base project) on real life RRMS management. The findings are not staggering, but just maybe what the doctor ordered. The most significant of the findings is that outcome that on a wide scale even the lowest efficacy drugs (interferons, glatiramer acetate) do something meaningful (see figure below). It goes without saying that the highest efficacy drugs do more, but the principle is treat MS.
For those initially treated with glatiramer acetate and interferons compared to untreated PwMS the conversion to secondary progressive MS at 5y was 12% vs 27%, and at 11y was 47% vs 57% (Figure A above). For fingolimod this was 7% vs 32% at 5y, and 7% vs 39% at 6y (Figure B above), and for nataluzimab this was 19% vs 38% at 5y, and 34% vs 48% at 6y (Figure C above). Alemtuzumab figures were 10% vs 25% at 5y, and 21% vs 41% at 8y (Figure D above). Moreover, it would also seem that fortune favors those who don’t hang about (see figure below). The benefit of earlier treatment with either glatiramer acetate or interferons waned (Figure C below) when commenced later than 5y (duration of disease was ~12y), and disappeared at approx. 8y (duration of disease was ~15y). The same applies if you escalate from glatiramer acetate or interferons to fingolimod, alemtuzumab or natalizumab within 5y versus those escalated later (Figure D below). Raising the point that those on treatment should be monitored carefully for disease activity in the early half of the disease. And as mentioned before, those receiving fingolimod, alemtuzumab or natalizumab at the outset had a significantly lower risk of progression than those initially receiving either glatiramer acetate or the interferons (see figure below). At 5y the difference was 7% vs 12% respectively, and at 9y it was 16% vs 27%, respectively. Importance Within 2 decades of onset, 80% of untreated patients with relapsing-remitting multiple sclerosis (MS) convert to a phase of irreversible disability accrual termed secondary progressive MS. The association between disease-modifying treatments (DMTs), and this conversion has rarely been studied and never using a validated definition. Objective To determine the association between the use, the type of, and the timing of DMTs with the risk of conversion to secondary progressive MS diagnosed with a validated definition. Design, Setting, and Participants Cohort study with prospective data from 68 neurology centers in 21 countries examining patients with relapsing-remitting MS commencing DMTs (or clinical monitoring) between 1988-2012 with minimum 4 years’ follow-up. Exposures The use, type, and timing of the following DMTs: interferon beta, glatiramer acetate, fingolimod, natalizumab, or alemtuzumab. After propensity-score matching, 1555 patients were included (last follow-up, February 14, 2017). Main Outcome and Measure Conversion to objectively defined secondary progressive MS. Results Of the 1555 patients, 1123 were female (mean baseline age, 35 years [SD, 10]). 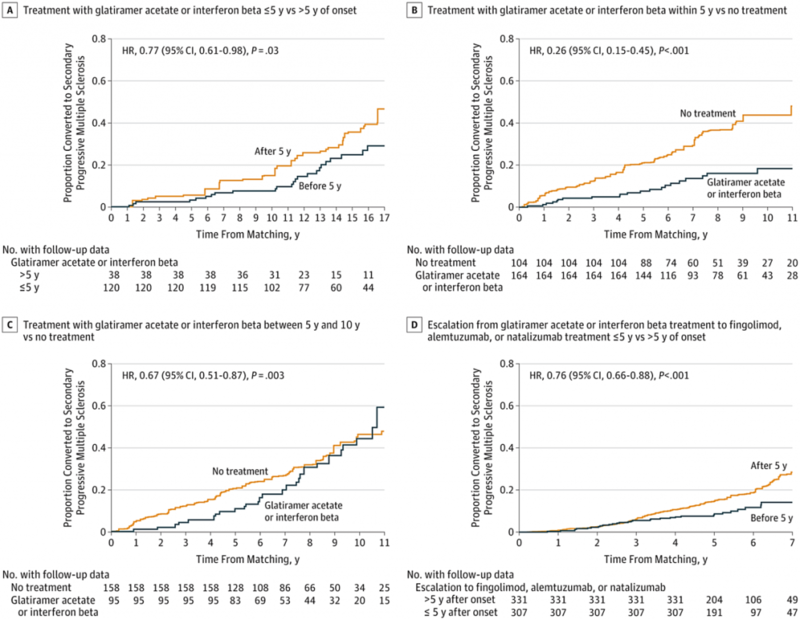 Patients initially treated with glatiramer acetate or interferon beta had a lower hazard of conversion to secondary progressive MS than matched untreated patients (HR, 0.71; 95% CI, 0.61-0.81; P < .001; 5-year absolute risk, 12% [49 of 407] vs 27% [58 of 213]; median follow-up, 7.6 years [IQR, 5.8-9.6]), as did fingolimod (HR, 0.37; 95% CI, 0.22-0.62; P < .001; 5-year absolute risk, 7% [6 of 85] vs 32% [56 of 174]; median follow-up, 4.5 years [IQR, 4.3-5.1]); natalizumab (HR, 0.61; 95% CI, 0.43-0.86; P = .005; 5-year absolute risk, 19% [16 of 82] vs 38% [62 of 164]; median follow-up, 4.9 years [IQR, 4.4-5.8]); and alemtuzumab (HR, 0.52; 95% CI, 0.32-0.85; P = .009; 5-year absolute risk, 10% [4 of 44] vs 25% [23 of 92]; median follow-up, 7.4 years [IQR, 6.0-8.6]). 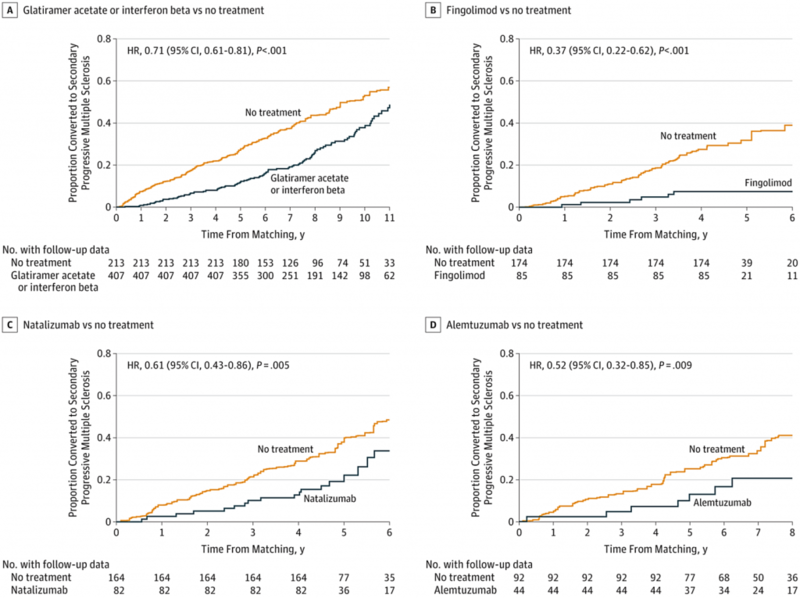 Initial treatment with fingolimod, alemtuzumab, or natalizumab was associated with a lower risk of conversion than initial treatment with glatiramer acetate or interferon beta (HR, 0.66; 95% CI, 0.44-0.99; P = .046); 5-year absolute risk, 7% [16 of 235] vs 12% [46 of 380]; median follow-up, 5.8 years [IQR, 4.7-8.0]). The probability of conversion was lower when glatiramer acetate or interferon beta was started within 5 years of disease onset vs later (HR, 0.77; 95% CI, 0.61-0.98; P = .03; 5-year absolute risk, 3% [4 of 120] vs 6% [2 of 38]; median follow-up, 13.4 years [IQR, 11-18.1]). 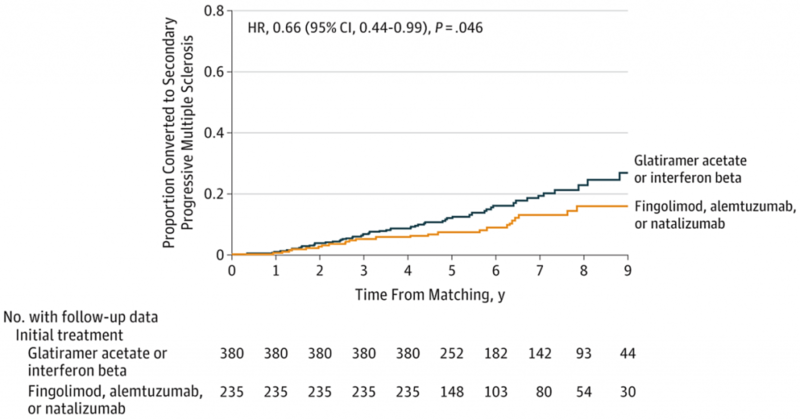 When glatiramer acetate or interferon beta were escalated to fingolimod, alemtuzumab, or natalizumab within 5 years vs later, the HR was 0.76 (95% CI, 0.66-0.88; P < .001; 5-year absolute risk, 8% [25 of 307] vs 14% [46 of 331], median follow-up, 5.3 years [IQR], 4.6-6.1). Conclusions and Relevance Among patients with relapsing-remitting MS, initial treatment with fingolimod, alemtuzumab, or natalizumab was associated with a lower risk of conversion to secondary progressive MS vs initial treatment with glatiramer acetate or interferon beta. These findings, considered along with these therapies’ risks, may help inform decisions about DMT selection. While I’m thrilled that natalizumab shows lower risk than untreated the difference is not as great as I would have expected. Pleasure. It is difficult compare the treatments head to head, because interferons/ glatiramer acetate pre-dated the entry of natalizumab. So although the comparison between natlizumab vs no treatment doesn’t look amazing as it should, those not on treatment may still be on sodium channel blockers, multitude of lifestyle changes that is very different to two decades ago when the earlier treatments were available. Very Good post. I agree to treat ms hard from the beginning. Unfortunately i am on the sad 7% that despite being treated with Fingolimod progressed in 5 yrs to spms….. It is clear that something is important is happening within the first 5 years after diagnosis. My take on this is early treatment may be more important than what treatment. Yes. I do a presentation from a biomarker perspective looking at exactly this, from the focal inflammatory model to a progressive one and how we should be monitoring this, i.e. pointless counting brain lesions at ten years after diagnosis as a marker of good treatment! Good question, we don’t know what happens to biomarkers if the OCBs disappear. Beyond NFL, I’m not aware of any other biomarker being measured in clinical practice. There are some that I’d like to bring into practice- whether they’d be accepted is a different story! I need to put in project to evaluate everyone who has so far had CSF neurofilament done to see how it compares in the blood. Research is one thing, but clinical practice is a whole different kettle of fish. Also surprised that Alemtuzumab didn’t fare better in curbing conversion rates. Isn’t this treatment supposed to be on par with HSCT? And doesn’t HSCT appear to eradicate all signs of MS in a high percentage of properly selected patients who undergo this treatment? What to make in the fairly wide discrepancy in the conversion rates of untreated populations? Or is this attributable to small sample sizes? The comparison is like with like based on a technique called propensity matching. It is likely that those who are started on fingolimod or the same as those started on natalizumab or alemtuzumab. Difficult to compare oranges and apples. I guess with Alem. you have to expect that about 1/3 of patients needs retreatment or do not respond to the drug as they should. Yes sample sizes, what Gavin said below, and bias on treatment allocation. HSCT isn’t recommended in those with an EDSS score >6, so it’s an EDSS issue. If you’re treating those with early progressive signs these will continue to be an issue or progress further down the line. The strategy needs to be adding neuroprotectants on top of the antiinflammatories in this group. From the First symptom to diagnosis it tooked 11 years. In Germany we dont get to decide wich treatment we would like. I was able to choose one of the first line Treatments (tecfidera). Would have loved to Start with ocrevus. Under the 2 years of tecfidera i suffered under ab Bit of weakniss in my legs 2 Times. The Second Time additional to the armes. Last mri was good, the next one is on 3 weeks. I believe they will See no change either. Is spastik? An in/off Thing with montags of absence? Love your Blog, sorry for my Bad English. Greetings from London. We are more fortunate that you might say that the powers of B gave us the option of Alemtuzumab in the UK. I’m sure that many of my colleagues would agree with me that it changed their practice. At the end of the day it is all about adoption and how many people you can string along with you! The problem that I see the figures is that there is a bias in the results, since patients with a more aggressive MS are more likely to become secondary and that leads to error in terms of the effectiveness of the drugs according to the figures . Yes, and this is also the problem with real life data; you have little control over your group selection that you may have say in a clinical trial. But, since it’s real life we’re dealing with, maybe the management needs to be more than one strategy in the highly active pwMS? Given that minor viral infections etc. can cause relpse, how does this work out with immunosuppressive DMTs? Good question, the report of minor infections in clinical trials of immunosuppressants is a significant one. However, this doesn’t seem to impact on the EDSS or the MRI parameters versus placebo. Hi Rosa, we cannot offer personal advice on the blog for obvious reasons, but mostly because without having seen you it will be a shot in the dark. I would say that at all stages of your condition treatment options, including trials should be discussed with your neurologist, and then there are things you can do yourself, lifestyle changes, importantly cardiovascular exercise – even if this a floor peddle bike, and manage your other co-morbidities/illnesses. Am I reading it right that fingolimod is the best dmt if you want to avoid conversion to SPMS? P.s. it is controversial that this blog suggests that MS is one and not two diseases, but at the same time you use the term spms. I’m afraid you cannot compare across the treatments, subjects were matched on annualised relapse rate in the year prior, EDSS score and disease duration. These would be different for each of the treatments in question due to the bias in treatment selection. All you can comment on is treatment vs no treatment. Controversy, to a point gets people thinking. Although Hamlet points out “there is nothing either good or bad, but thinking makes it so”. Unfortunately, you do have to stick to what is published and that’s what I’ve done! Interesting to see Fingolimod does so well, 7% at 5 years and still 7% at 6 years. I’m hoping cladribine suits me and slows or even halts progression for me. Diagnosed only since last year but they believe I’ve had it for 15 years (a couple of bouts of optic neuritis), I’m hoping that I’m not part of the “later in the disease” group as I am young (ish) and feel good and would not like to progress fast. On a side note, is there a way to “map your potential progression” based on previous symptoms/relapses/duration etc? Like a tool where you enter your information and it gives a “outcome”? I hope this is the case as this statement gives me huuuuge hope. Comi’s article suggests that serum NfL levels are usable as an indicator of smoldering MS. Are there any pointers for what levels we should use as a cutoff point? Can we just rebaseline this after NIRT/SIRT and watch for changes, and if there are, do the lumbar puncture? I’m sure that I can’t get this measured at my Neuro or hospital (as it’s not a part of clinical practice yet). I’m not even sure they measure NfLs in CSF outside research projects… However this is extremely easy stuff to monitor if you’re NEDA-3 and want to know if there is something still going on without CSF lumbar puncture. Is this something that can be done at some other lab, or even better, can blood be send from my hospital (in Central Europe) to some other hospital abroad? Or is this exclusively research stuff that’s not available to ordinary patients or just too expensive to be done by a patient? Surely these results are only truly meaningful with an older age group. SPMS in those with a mean age of 35 is much less likely than a group of 50 year olds. Totally agree with you. At onset I had severe relapses in my twenties. I tried to lead as normal a life as possible. I’m now in my sixties and have SPMS. There are so many of us that are not on the radar. I was told in my early forties that I’m doing something right but they don’t know what it is. No one ever asked me. Every time Professor Giovannoni suggests the healthy lifestyle, there are many bloggers that post angry comments. Well we are out there, not having had access to any DMTs, that followed that healthy mantra, ignoring the fad diets and false media claims and somehow managed to slow the onset of a high EDSS. Not saying it works for everyone, but we had no other choice.